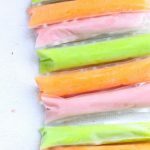 FROZEN YOGURT POPS -- insert a popsicle stick into yogurt and freeze! So ever since I wrote my latest for Tablespoon, I’ve been freezing yogurt. I just can’t stop, it’s so ridiculously easy to make (stick in the freezer) and tastes so good. 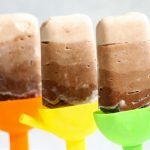 DIY frozen yogurt pops! Just cut a slit in a container of yogurt, insert a popsicle stick, and freeze! Just be sure to use pre-mixed yogurt, not fruit-on-the bottom, and make sure to use a container that’s bigger on the top than the bottom so the frozen yogurt can come out of the container. 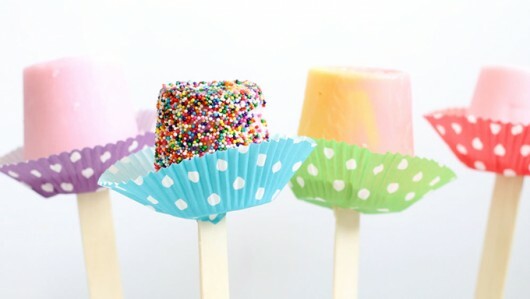 If desired, cover in sprinkles and use a cupcake liner to catch drips. If you’re having trouble removing the yogurt, run the container part under hot water for a few seconds. Find the how-tos for the Fro Yo Snack Hack HERE at Tablespoon. 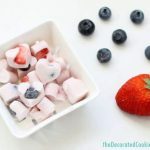 If you like these, you’ll love these frozen yogurt bites or these frozen yogurt fruit pops.